Many of our highly-valued and greatly-prized pedigree breeds of dog came to us as a result of the inspired work of gifted breeders in the past. 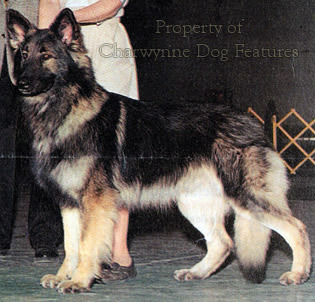 The Korthals Griffon, a superlative gundog, the Airedale, once a top-class hunting dog, the Dogo Argentino, a high-class boarhound, the Anglo-French scenthounds, great sporting hounds, the Bullmastiff, once famous as a gamekeeper's night-dog, and the Russian Black Terrier - selectively bred from a number of breeds to produce a superior service-dog, each of these a purpose-bred breed from blends of other breeds. All these hybrid products are the direct result of man's pursuit of better dogs, usually by a dedicated single-minded breeder, a timeless activity. Purebred dog breeding only came about when the breeding stock merited such a step; it was conducted by informed breeders desiring stability of proven lines not the blind pursuit of purity for purity's sake. I have seen some inspired crossings by enlightened breeders over the years, from the Sprockers and Clumber-Springer crosses and the Pointer-Newfoundland crosses in the shooting field, to blends of hounds and terriers, recreated mastiffs, bulldogs and a Samoyed-Collie hybrid for the hearth. For perhaps twenty thousand years the unique partnership between dog and man has undergone many changes. The introduction of firearms and then "shooting flying" altered the way in which what are now called gundogs were utilised. The preference for "hunting cunning" led to scenthounds with their noses down being preferred to par force or "fleethounds" which went like steeplechasers. The change to moving sheep and cattle by rail and truck meant a change in role for the old drovers' dogs and some of the sheep herding breeds all over Europe, leading to new employment for breeds like the Bouvier des Flandres, the German Shepherd Dog and the Malinois with the police and army. But the advent of dog-shows, the breeding of dogs principally for their physical appeal and the subsequent reverence for the pedigree has in the last hundred years or so, resulted in pure-breeding in both a highly-selective and a deliberately exclusive manner which is having a marked effect on the health and performance of the domestic breeds of dog. The awe in which the pedigree is held has achieved such a level that when pure-bred dogs are advertised for sale it is more common to find the words "excellent pedigree" than excellent dog. Yet in historic terms this is a very recent innovation in dog-breeding, mainly coming from show breeders line-breeding for identified show points. Sportsmen, of course, have known for centuries that good dogs come from good ancestors, that prowess runs in families and that field performance is passed on through the blood. 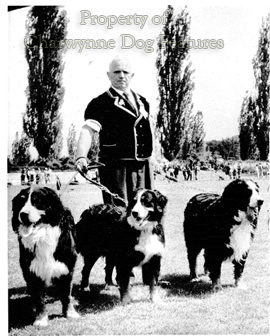 It is nevertheless a fact that this century has seen a dramatic change in how dogs are valued, as John Holmes, the distinguished dog-trainer once pointed out in his perceptive "The Family Dog" (1957)..."a dog that could win in the show ring might be of greater value than a good worker. In other words, for the first time in history, a dog that could do nothing, which had hitherto been regarded as useless, could be worth more money than one which would work". Nearly all our present breeds came about in the search for functional animals not out of a desire for handsome ornaments valued because of their racial purity. Paradoxically, however, it was only by cross-breeding and out-crossing that the different terrier, herding, hound and gundog breeds were produced in the first place. Our ancestors never hesitated to out-cross in pursuit of an enhanced field performance. The celebrated Colonel Thornton in the 18th century experimented with a Foxhound-Pointer cross to improve the scenting powers of his shooting dogs. 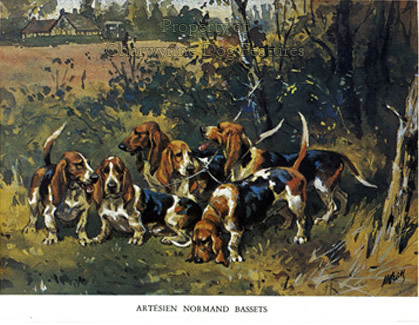 The French have constantly brought new blood into their scenthound breeds as some of their contemporary breed-names indicate: Anglo-Francais Tricolore, Grand Gascon-Saintongeois and Basset Artesien-Normand, for example. Such cross-breeding was not done lightly. Some breeds have been specifically developed for a particular role or function like the Otterhound, the Bloodhound, the Sealyham Terrier and the Boulet Griffon, but always by the planned intentional use of the contributing breeds. Over the years too, we have overtly introduced outside blood into some breeds like the Irish Wolfhound, Mastiff, St Bernard, English Basset, Field and Sussex Spaniels. Less overtly, Fox Terrier blood has been introduced into Welsh Terriers, Foxhound blood into Labradors, Rough Collie blood into show Border Collies, Greyhound blood into some Pointer lines and Pug blood into Bulldogs. But whether admitted or not, such measures nowadays are exceptional; in all recognised pedigree breeds of dog the gene-pool is closed. This is fine when things are going well. From the point of view of desiring that all dogs in a breed look like the others, this can be understood. But it has coincided with and almost certainly contributed to there being not only well over 400 different inherited physical abnormalities in dogs, but defective temperament too, such as excessive shyness in a number of breeds, a lack of working instinct or an inability to think for themselves in others, a dangerous instability in some golden Cockers and a wild-eyed unsteadiness in a number of breeds, some of them sporting breeds. And to the better-known inheritable conditions such as hip dysplasia, progressive retinal atrophy, entropion, hereditary cataract, lens luxation and retinal dysplasia can now be added some more recently encountered, such as copper toxicosis, juvenile pyoderma, achondroplasia, canine wobbler syndrome, ischemic mylopathy and osteochondritis dissecans. On moral grounds we can find much to resent in the pursuit of fad breed points beyond historical precedent which discomforts the breed concerned: the sunken eyes and ground-dragging ears of the show Basset, the excess of loose skin in the Bloodhound, the over-abundance of forehead skin in the St Bernard and Clumber spaniel, the respiratory problems of the Bulldog and the physical weakness of Mastiffs bred for great bulk and of Great Danes bred for great size. Such problems could so easily be overcome or lessened by outcrossing, say with the Basset to the Harrier (as the hunting fraternity already have), the Bloodhound to the Dumfriesshire Foxhound (as the field Bloodhound breeders once did), the St Bernard to its sister breed the Great Swiss Mountain Dog and the Bulldog to the Staffordshire Bull Terrier (which is far closer to the old bull-baiting dogs than the former). But this will not happen, not so much from a lack of concern over the well-being of the dogs involved but almost entirely because of a slavish reverence for pedigree-breeding. 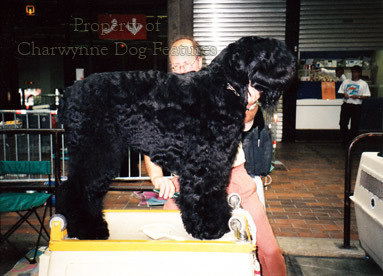 The famous master-breeders who gave us these superb breeds in the first place would have never hesitated to outcross in order to obtain and then retain the desired characteristics they were seeking. Laverack produced outstanding English Setters but not from solely English Setter blood. When Sir Everett Millais found that the Basset Hound was deteriorating through inter-breeding, he quickly introduced a Bloodhound outcross. Who in the show-dog world would have the guts or the vision to do that nowadays? Yet he is revered by the Basset Hound fraternity. How can you revere the work of a master-breeder unless you honour his method? I doubt if there is the moral stuffing in today's breed clubs to produce a sounder healthier dog at the expense of show ring success but those who use dogs that earn their living ought to be giving this matter some thought. The lurcher and terrier men have of course long ignored the sanctity of the pedigree and pursued effectiveness i.e. performance in the field. Shooting men by and large seem to copy their show ring counterparts, despite the unprecedented occurrences of inheritable diseases in the gundog breeds, the loss of 'type' in so many Labradors, English Springers looking more like Cockers, the loss of the true colour in Golden Retrievers and yellow Labradors and the deterioration in field performance of the minor breeds. How long ago it seems that very competent cross-bred retrievers competed at field trials! How worrying it is to see so many skilfully-bred German dogs displacing ours in the shooting field. 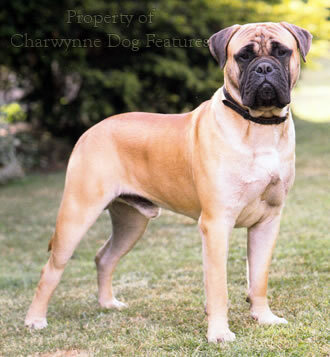 I am more than happy to see well-bred soundly-constructed pedigree dogs flying the flag for their breed and I would never advocate cross-breeding ahead of wise informed skilful pedigree line-breeding. But why do The Guide Dogs for the Blind organisation prefer to use cross-bred instead of purebred retrievers? And why blindly adhere to a closed gene-pool in circumstances which no master-breeder of previous centuries would have felt justified, when an infusion of new blood in some breeds would actually restore 'type' and improve performance and when your pedigree dog is ill from genes and not germs? Perpetuating sickly dogs solely because they are purebred is entirely irrational and indirect cruelty. The Russians, whilst still under a doctrinaire regime, purpose-bred their Black Terrier from carefully selected ingredients to produce a healthy, virile, biddable all-purpose service-dog. We, once revered the world over as livestock breeders, now have a long list of ailing native breeds. Our ancestors must be rotating in their graves over such folly. Is it a coincidence that the inspired breeding of top-class lurchers and working terriers is being conducted almost entirely by working class breeders. A few, just a few, gundog men are emulating them. Cross-breeding to aid a pure breed, or out-crossing as it is known, is becoming less unthinkable for the more enlightened pedigree dog breeders. It is easy to overlook the fact that all our recognised breeds came to us from cross-breeding. It is often overlooked that the dog insurance companies charge a lower premium for cross-bred dogs than for pure-bred dogs, based on medical cost research. 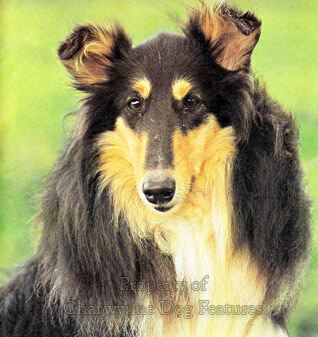 It is nearly always overlooked that covert cross-breeding gave the Rough Collie the Borzoi head and the show Border Collie its more profuse coat from the Rough Collie. It is conveniently forgotten that outcrosses to the Greyhound revitalized the Deerhound and that to the springer helped the Field Spaniel. Now further outcrosses are being condoned. Some years ago an outcross from the Boxer to a Spitz breed was tried in order to produce erect ears. 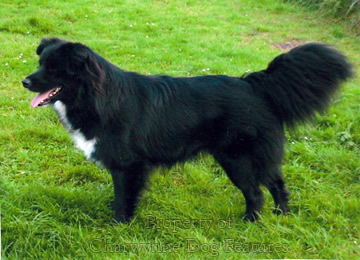 More recently Boxers have been crossed with corgis to obtain naturally docked tails. 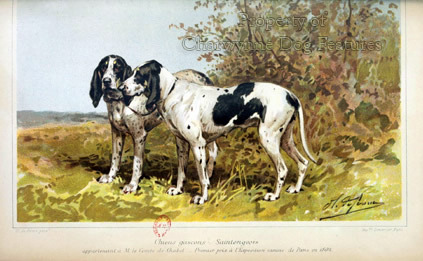 In America, the outcrossing of the Dalmatian to a Pointer brought about an appreciable reduction in breed-disposed deafness. In Finland, pinschers and schnauzers are being crossed to widen the gene pool. They share common ancestors anyway. KC-registered Otterhounds however are unlikely to be outcrossed to the Welsh Foxhound as they might have been as pack members. In the USA, purpose-bred Assistance Dogs produce a 40% success rate from cross-bred dogs against 33% for pure-breds. In-breeding is coming under greater scientific scrutiny as inheritable defects in pedigree dogs increase. Professional breeders of production animals such as cows, pigs, goats, sheep and horses consider that a coefficient of in-breeding of around 9% is risky. One researcher in America found that in dog breeds there is a decline in the average life span of around 7% for every 10% increase in in-breeding. Dwarfism has been found in Pointer litters at in-breeding coefficients of 13 to 37%, whereas unaffected litters rated 0 to 24%. In a Foxhound pack, the conception rate with sperm of in-bred dogs was 73% against 87% with out-bred ones; average litter size was 7 against 9 and 4 against 6 at weaning. The sperm count was 70 against 367. Swedish pedigree dogs of 60 breeds had an average in-breeding coefficient of 14%. Why do breeders of production animals seek healthier animals than dog-breeders? When a geneticist, himself in Boxers, finds it necessary to pose the question: Are there any Boxers that are truly free of heart murmurs? we have much to think about. He himself was brave to outcross for the naturally docked tail - and why not? The Metropolitan Police Dog Section now prefers a GSD-Malinois mix to a purebred dog, which was stated to have 'horrified' one GSD fancier. 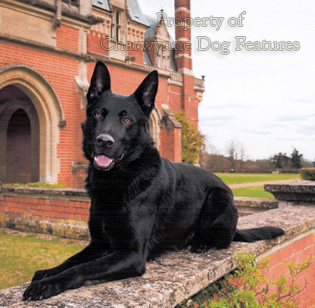 The Thames Valley Police Dog Section has purpose-bred its own version of the GSD, more like the Eastern European Shepherd Dog, out of their disenchantment with the pedigree GSD, as have the Shiloh Shepherd and King Shepherd Dog enthusiasts in the USA. Matthew Breen, a Yorkshireman, now a canine cancer geneticist in North Carolina, has reported that cancer is now so fixed in the Bernese Mountain Dog that an outcross is the only viable solution. But this is not an option for pedigree dog breeders; they'd prefer the pure-bred problem to the cross-bred solution. Yet the hunting dogs of the Hadzabe Bushmen, virtually a stone-age people, in Northern Tanzania, have no cases of inheritable defects in their randomly-bred hunting dogs! We, arguably better educated Europeans, are breeding our dogs to death. Inspired breeders produce new editions - and dogs are better for it!